KAVOURI, Greece (AP) — The eurozone’s top official said Monday that Greece and its European creditors are on a good path to completing the latest round of bailout talks, with a view to a “clean exit” from strict fiscal supervision. Jeroen Dijsselbloem said the recession-battered country is regaining credibility, with a “very strong” fiscal performance in 2016 and 2017. “A clean exit, and full exit in August of next year — that’s our common goal so that Greece is once again independent financially and sovereign in its decision-making,” Dijsselbloem said after meetings with Prime Minister Alexis Tsipras and top financial officials in Athens. He renewed a European pledge to provide additional relief for repayment of Greeks staggering national debt that is nearly 180 percent of gross domestic product. Greece’s once anti-bailout left-wing government has promised to speed up cost-cutting reforms in the next few months. And George Chouliarakis, the deputy finance minister, said the government planned to tap private bond markets “several times” before the end of the rescue program. Greece has relied on international bailouts since 2010. In exchange, it imposed painful spending cuts, tax hikes and reforms. 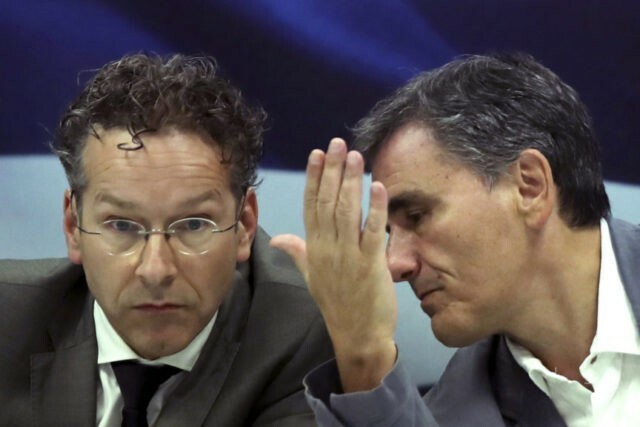 Dijsselbloem said he believed the result of Sunday’s German elections shouldn’t affect Greece’s bailout program. “The elections in an individual country cannot change what we have agreed” in the meetings of eurozone finance ministers, Dijsselbloem added. Also Monday, the European Union said it has ended its procedures meant to force Greece to reduce its deficit as the country gets its books back in order despite being mired in debt. EU headquarters said Greece’s “deficit is now below 3 percent of GDP,” the ceiling for European government deficits. Greece’s debt stood at 179 percent of GDP last year. But it recorded a budget surplus of at 0.7 percent of GDP in 2016, and while a small deficit is forecast this year, the EU said the Greek fiscal outlook is improving.